**TRILOGY at It's Best! **Gorgeous Curb Appeal & RECENTLY UPGRADED Home including NEW PREMIUM HARDWOOD Floors & Beautifully Updated Kitchen! **Shows Like a MODEL w/ Pride of Ownership! 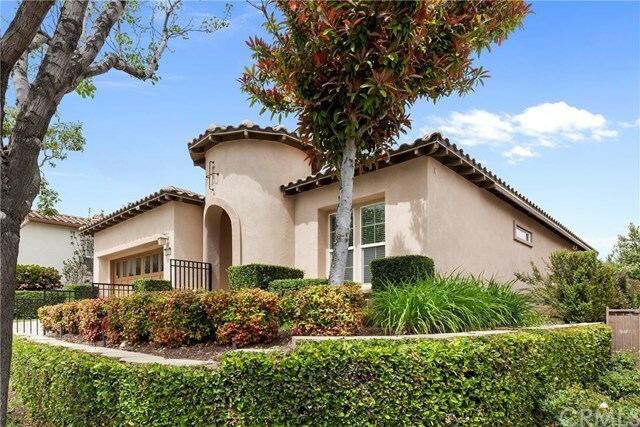 **Come Discover, if you haven't already, the Premier 55 + Active Adult Community in South Corona located next to World Famous GLEN IVY Hot Springs & Surrounded by the Scenic & Lush TRILOGY at GLEN IVY Golf Course. This Move-In Ready Home is located inside the Quiet, Private & Gated Community on a Beautiful Tree-Lined Street. **Stylish Gated & Covered Entry...Desirable Model Features 2 Spacious Bedrooms, Upgraded Kitchen w/ Granite Counters & Large Island, Cherry Wood Finished Cabinets, Satin Nickel Pulls, Separate Laundry Room w/ Sink & Storage. **Great Room features a Lovely Fireplace & Large Media Niche...Sliding Glass door leads you out to a Pristine Backyard including ample Patio space, Stone Path & Gorgeous Flowering Plants & Palms! **Professionally Landscaped Front & Back. **Elevated Backyard well above the cul-de-sac below will Wonderful Views! **Spacious Master Features Dual Sinks & Large Walk-In Closet. **RESORT Level Amenities such as Health Club, Indoor and Outdoor Pool, Spa, Tennis Courts, Boccie Ball, Indoor Waking and Running Track, BBQ area, Ball Room, Meeting Rooms, Craft Room, Card Room, Billiards & Amphitheater for Summer Concerts! **Easy access to Shopping & Entertainment, Shops at Dos Lagos, Glen Ivy Hot Springs & Toms Farm.